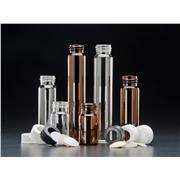 Available in clear or amber borosilicate glass. Choice of closure and linter, including patented Top Hat™ liner system. Fixed (bonded) closures eliminate liner fallout.